Firefighting is a field of spontaneous physical demands. Success is predicated on meeting these demands quickly and competently, and human life often swings in the balance. Firefighters must be prepared to deal with any number of eventualities--lugging equipment, carrying another person, knocking down a wall, scaling a building, crawling, dragging, rappelling, running, or any combination of these, usually while bearing some sort of load. 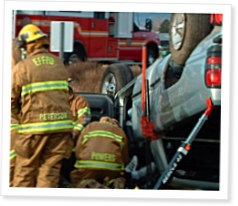 Tasks are presented in a random sequence, and firefighters must be able to deal with them as they come. CrossFit mimics and trains for the spontaneous nature of working in the field. Like firefighting, CrossFit relies on a finite set of skills ordered in an infinite number of combinations. A firefighter may respond to a chemical fire one day and a structure fire or wildland blaze the next, one in a school zone one day and in a rural area with poor access to water the next. While the firefighter's skill set is finite, the contexts in which those skills are brought to bear are anything but. The CrossFit community has long recognized the connection between the demands of the firefighter's job and the stimulus and adaptations provided by our brand of fitness. CrossFit is now employed by firefighters across the country and around the world. In honor of those who lost their lives on 9/11, the CrossFit Journal presents the CrossFit.com WOD for Sept. 11, 2013, in special format. CrossFit community comes together to commemorate the Hotshots 19 and raise funds for their surviving family members.